An RSS feed (or news feed) is a means by which you can stay informed about what's going on at Harmony on the Sound without having to regularly visit the website. Karen Sweeters is the heart and soul of Harmony on the Sound Chorus. With over 35 years in Sweet Adelines International, she has gone from singing "on the risers" to directing and growing the chorus into what it is today. Known for her easy going manner and creativity, she decided early on that her chorus would rise to new heights by doing something different. With Lyricist Jane Tamarkin, she started preparing the competition songs as parodies. Over time the judging panels began to look forward to hearing what she would come up with. 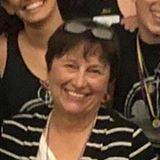 Karen is a Certified Judge in the Expression Category and has escalated to the top level of Sweet Adelines musicianship as a Master Director. During the contest "season" she jets off to other regions where she joins her peers in adjudicating their quartet and chorus competitions. She is also a valued coach to many Sweet Adeline Choruses around the world. Sometimes she travels on her own, and other times she travels as part of the "Stage Coaches" which is made up of Jane Tamarkin, Gina Kaiser and her. In addition to being the in-house lyricist, Jane is a performance and characterization specialist. Gina is a choreographer, visual specialist and Certified Showmanship Judge. Come for a visit to meet Karen. We know you'll love her as much as we do! Harmony on the Sound is committed to protecting your personal data and will use any personal or sensitive data we collect from you. In Europe, this is in line with the General Data Protection Regulations (GDPR). Harmony on the Sound collects data from individuals to help us plan, organise and run the day-to-day operations of the group (e.g. co-ordinating rehearsals or collecting subscription payments) and to promote and market the group’s activities (e.g. marketing mailing lists and photography/video capture). This data will be used by our admin team to manage your membership with Harmony on the Sound and to organise and run our activities. When you sign-up to our marketing mailing list we will ask for your email address and will use this data to send you information about our events and activities (e.g. upcoming events, latest news, etc). We will only send you information that is related to Harmony on the Sound. (i.e. we will not use your data to send you marketing messages from 3rd parties). If you purchase an event ticket, or Harmony on the Sound merchandise, or make a donation, we need to collect data on the person making the purchase. This data will only be used for administering your booking/purchase/donation, and will not be used to send you marketing/promotional messages from the group. The Harmony on the Sound data retention policy is to review all data held on individuals at least every two years and remove data where we no longer have a legitimate reason to keep it.